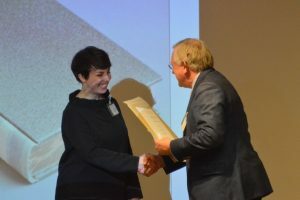 Kathy Abbott, who was awarded the Marsh Trainer of the Year, has been a bindery manager at an antiquarian booksellers for over eight years, while also working as a part-time tutor, a partner in a bookbinding company, a founder member of an international bookbinding collective, and exhibiting widely. Kathy is currently teaching two different courses. One is an advanced level Fine-Binding in Vellum course at City Lit, London. She is also teaching one-to-one fine-binding as part of a QEST scholarship. Recent trainees of Kathy’s include one who has become a Licentiate of Designers Bookbinders and has won numerous bookbinding prizes and another who is now working as a book conservator for an antiquarian bookseller. A few other trainees have set up their own bookbinding practices.